The orthopedic braces and support, casting and splints are finding takers fast owing to patients increasingly seeking better quality of life. This coupled with increasing number of sports injuries has provided a substantial fillip to the market. The latter has resulted in the swift uptake of foot and ankle devices, in particular. In fact, the American Academy of Orthopedic Surgeons (AAOS) finds that about a quarter of sports injuries are caused in the ankle and foot. Yet another factor majorly boosting the global market for orthopedic braces and supports, casts, and splints is the burgeoning geriatric population and alarming rise in obesity. The elderly population is highly susceptible to bone disorders such as arthritis, osteoporosis, and back pain. The obese are also at increased risk of bone disorders owing to excessive body weight putting severe pressure on the joints in the lower extremity. Some of the key companies operating in the market are Prime Medical, Zimmer Biomet Holdings, Inc., 3M Healthcare, Össur Hf, DJO, LLC, and Stryker Corporation. 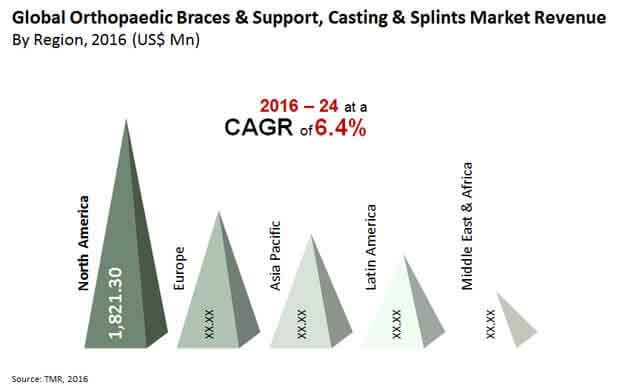 The global orthopedic braces and support, casting, and splints market was worth US$4.6 bn in 2015 and expanding at a CAGR of 6.4% during 2016 and 2024, it is slated to reach US$7.9 bn by 2024. Based on distribution channels in the global market for orthopedic braces and support, casting, and splints, the orthopedic clinics segment leads. This is because orthopedic clinics are mostly preferred for treatment of bone disorders. Going forward, the segment is predicted to retain its dominance due to treatment specificity and diversity in product availability. In terms of growth rate, the ecommerce and hospital segment are also expected to rise at a healthy clip. Product-wise, orthopedic braces and support segment leads the market. The product segment is slated to clock healthy growth in the near future to account for well over half the market share in 2024. The demand for braces is predicted to rise because of the rising instances of obesity. In close collaboration with doctors and orthopedic technicians, manufacturers are coming up with more cutting-edge products and product concepts which have a much better effect in supporting and improving immobility. North America leads the global orthopedic braces and support, casting, and splints market with maximum share. In the near future too, it is slated to retain its leading position on the back of a sizeable proportion of the population suffering from bone disorders such as osteoporosis and osteopenia. Other factors propelling the market in the region are a robust network of clinics and hospitals in the U.S. and continued technological progress in the healthcare industry. The market in Asia Pacific is also forecasted to grow at healthy clip – a CAGR of 7.3% during 2016 and 2024. It is considered one of the most attractive markets because of the growing accessibility to essential healthcare services, rising awareness regarding available treatment options, and increased expenses on healthcare services. India is a key economy powering the growth in the market in Asia Pacific. The swift pace of urbanization and robust policy support by the government along with improving healthcare conditions is driving impressive growth in the Asia Pacific market. Other developing countries in the region are also prompting corporate hospitals to provide enhanced facilities in the orthopedic segment, thereby significantly filliping the Asia Pacific market. The orthopedic braces & support, casting & splints market is driven by growing hip and knee replacement surgeries globally. Furthermore the rising coverage of healthcare and increasing prevalence of obesity is expected to be the most vital reason for expansion of the braces and support market growth. However, there are few hindrances, which further can affect the use of products such as braces, supports, casting and splints. In 2010, a survey by National Health and Nutrition Examination, there were some extracted conclusions about the rising obesity in the region such as, there were around two in three people were considered to be obese, more than one in 20 people were considered as extreme obese. Orthopaedic surgeon should be aware of various supports and braces for the treatment of bone disorders such as osteoporosis and osteopenia. Severe cases of spinal instability always need a Hohmann overbridging brace, whereas the milder form of motion-segment instability is treated with one of the elastic supports. In cases of osteoporosis of the spine and insufficiency of the lumbosacral junction the Lindemann 2/3 semi-elastic brace is prescribed. Norton and Brown (1957) studied that braces can help in immobilization of the joints for treating the fractures and other complications. Specifically they concluded the result for effect of braces on the movement of the lumbosacral area and never found total immobilization. The effect of lumbar supports is a decline angle for angle of flexion and extension. Axial rotation and lateral bending is not reduced. Technetium-99m is the preferred radioisotope for medical imaging due to its short half-life and appropriate energy emission for perfect image. It is generated by source named molybdenum, which is an abundantly present on earth. However, the process of producing its daughter isotope is a rigorous task it represents a high value in terms of availability. In close co-operation with doctors and Orthopaedic technicians, orthopedic industries has developed innovative products and product concepts, which depending on the goal of the therapy are effective in supporting and improving immobility, unloading damaged areas of joints and reassuring & reactivating the patient. Few orthotic braces are used indirectly, meaning they just support the injured joints in the body. For instance, an ankle foot orthotic device (AFO) that is used to address drop foot – common symptom after a stroke that results in the loss of the ability to control the ankle joint – the use of an AFO in this situation maintains the actual posture of the foot and ankle, allowing the patient to walk without any problem. The report is a combination of primary and secondary research. Primary research formed the bulk of our research efforts, with information collected from telephonic interviews and interactions via e-mail. Secondary research involved study of company websites, annual reports, press releases, stock analysis presentations, and various national and international databases. The report provides market size in terms of US$ Mn for each segment for the period from 2016 to 2024, considering the macro and micro-environmental factors. Growth rates for each segment within the orthopedic braces & support, casting and splints market have been determined after a thorough analysis of past trends, demographics, future trends, technological developments, vaccination expenditure, and regulatory requirements. The market overview section of the report includes qualitative analysis of the overall orthopedic braces & support, casting and splints market including the determining factors and market dynamics such as drivers, restraints, market trends and opportunities, along with white space analysis. In addition, market attractiveness analysis by country, isotopic application and end-user along with competitive landscape by key players have been provided which explain the intensity of competition in the market considering different geographical locations. The competitive scenario between market players has been evaluated through market share analysis. These factors would help the market players take strategic decisions in order to strengthen their positions and increase their shares in the global market. Pricing and cost teardown analysis holds a crucial part of the report, which further describes the cost to end-user and cost to patient. The market is driven by changing prevalence of obesity and osteoporosis. The market is projected to grow due to increasing investment in healthcare sector. In terms of distribution channel segment orthopedic clinics is projected to expand at a high CAGR on the backdrop of growing investment healthcare during sports injuries. The E-commerce and hospital segment are expected to expand at a high CAGR over the forecast period. Geographically, the global orthopedic braces & supports, casting & splints market has been segmented into five regions with North America leading the market in 2015 followed by Europe and Asia Pacific. The requirement for orthopedic splints and casts are rapidly growing in Asia Pacific due to increasing direct and indirect investments by the Government and other private companies. Increasing investments and penetration by key market players globally are expected to drive the orthopedic braces & support, casting & splints market during the forecast period.